See here for updated July data. 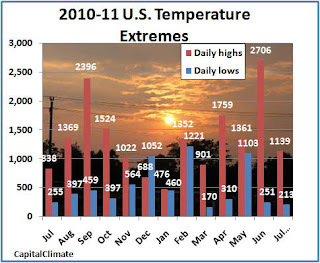 Aug. 1 Update: Chart updated with July 2011 record-breaking average of 84.5°. July 31, 6 PM Update: Today's high of 99° and preliminary low of 80° each exceeded expectations by about 6°. If the low holds, the monthly average will increase to 84.5°, which is a remarkable 1.4° above the old all-time monthly record tied last year. 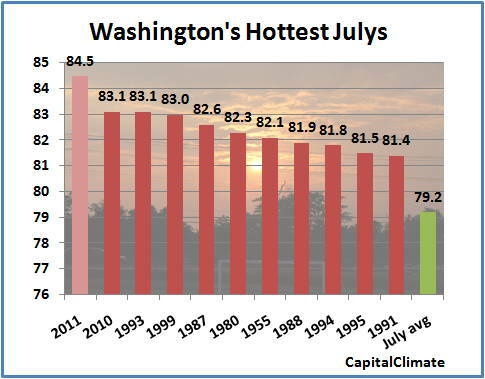 July 30, 5:30 PM Update: The daily high temperature at Washington National is 97°. July 30, 2 PM Update: The high so far is 96°. The month-to-date average is up to 84.3°. July 30, Noon Update: The morning low temperature of 81°, if it were to hold through midnight, would break the high minimum record by 3°. July 30, 1:30 AM Update: The Washington daily low temperature of 80° is confirmed, tying the record high minimum set in 1949. The number of daily high minimums set or tied this month is now 6, and the record of 78° for the 30th is looking vulnerable with a current temperature of 85° (although the dewpoint is significantly lower than last night). July 29, 5:30 PM Update: The preliminary daily climate report is in with a high of 104°. That smashes the previous Washington daily record by 5° and is just 2° below the all-time high. It's also enough to squeak out another tenth of a degree on the monthly average to date, raising it to 84.2°. The high of 103° broke the Dulles record by an amazing 6°, and the 101° at Baltimore/BWI also set a record. Baltimore downtown (Inner Harbor) was 104°. July 29, 5 PM Update: And, in fact, the 5:00 temperature is 103°, raising the record still further. Washington Dulles is at 102°, a daily record there by a margin of 5°. July 29, 4 PM Update: Today's high/low temperatures so far of 102°/80° raise the month-to-date by 0.2° to 84.1° and the projected final average to 84.3°. Since the reading has been 102° for 3 consecutive hours, it's likely that the final high will be at least 103°. For the second year in a row, July will be the hottest month ever observed in Washington since official climate records began 140 years ago. Unlike 2010, however, when the July record accomplished a tie with 1993 by the narrowest possible margin, this July is literally burning up the record books. With today's high/low of 95°/78;deg;, the monthly average to date is 83.9°, well above the previous record of 83.1°. Factoring in the forecast of a record-tying 99° tomorrow and more 90s for the last 2 days of the month, the average is likely to reach 84.2°, over 1° above the old record. This would be a bigger difference from the previous record than the difference between the current hottest July and the 5th place holder. Welcome, Tom Nelson fans. Check out what you've been missing here. July 29 Update: A 24-hour total of 1.40" through this morning extends the July record to 11.15" and raises the month to number 7 overall. 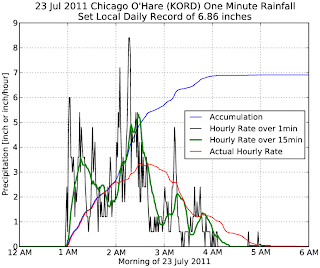 After getting an all-time record daily rainfall on Saturday, Chicago received another 0.71" on Wednesday, July 28. This pushed the monthly total to an all-time July record of 9.75". An additional 0.06" has fallen so far today, raising the amount to 9.81". 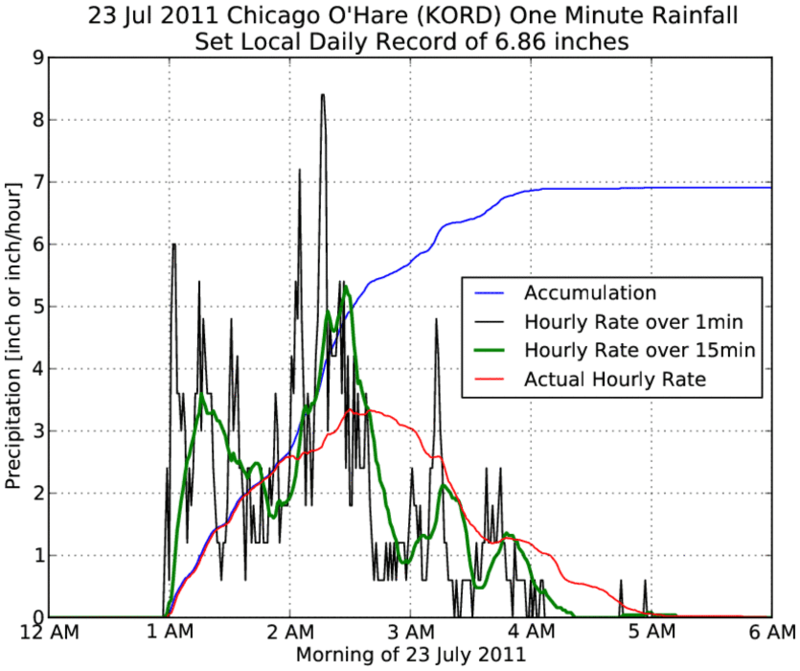 July 2011 is now the 9th wettest calendar month at Chicago. The National Weather Service (NWS) reports that the 6.86" of rainfall at Chicago on Saturday, July 23, broke the record for the date of 2.79" set just last year. It also set an all-time calendar day precipitation record, surpassing the 6.64" on September 13, 2008. The 8.20" of rainfall in a 24-hour period ending 7 am CDT Saturday was below the record set on August 13-14, 1987, however. With one week remaining in the month, the July total of 9.04" is now slightly over half an inch below the July monthly record of 9.56" in July 1889. The 0.45" of rain which fell through the first 3 weeks of the month would have made this the 3rd driest July in 140 years of Chicago records dating back to 1871. They haven't matched the incredible pace of June records, but U.S. temperature extremes this summer continue to overwhelmingly favor hot records vs. cold records. Through the 23rd, the number of daily high temperature records reported by the National Climatic Data Center (NCDC) in July outnumbered low temperature records by a ratio of over 5 to 1. 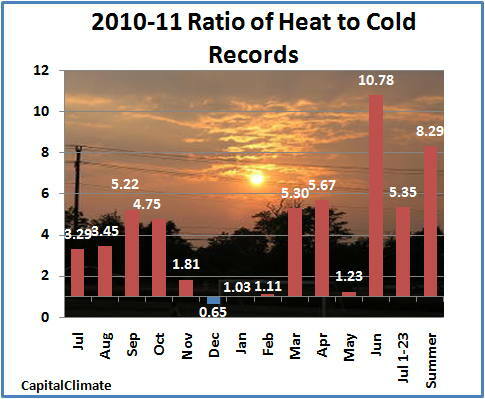 Combined with June's torrid ratio of nearly 11 to 1, the ratio for the summer to date stands at 8.3 to 1. For the year 2011 to date, as well as the last 12 consecutive months, the ratio has risen to 2.6 to 1. December 2010 is now the only month in the past 17 consecutive months with more cold records than heat records, and that was only by the slim margin of about 1.5 to 1. Results have been particularly dramatic for longer-term records. A total of 65 all-time July monthly heat records have been set so far vs. only 8 monthly cold records, for a ratio of over 8 to 1. Out of those July monthly records, 44 were all-time record highs for any month. 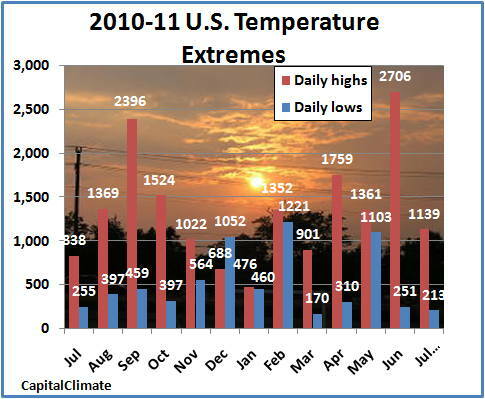 Monthly ratios and monthly total numbers of daily high temperature and low temperature records set in the U.S. for July 2010 through July 23 2011; Cumulative excess of heat records vs. cold records since January 2010. Data from NOAA National Climatic Data Center, background image © Kevin Ambrose (www.weatherbook.com). Includes historical daily observations archived in NCDC's Cooperative Summary of the Day data set and preliminary reports from Cooperative Observers and First Order National Weather Service stations. All stations have a Period of Record of at least 30 years. 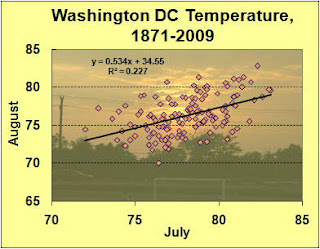 Image (click to enlarge): Graph from National Weather Service shows temperatures above 80° at Washington, DC for over 4 consecutive calendar days. July 25, 5 PM Update: The daily low has now dropped to 79°, ending the streak of 80°+ temperatures. The 79° was first reported at 4:15. July 25, 2 PM Update: Thunderstorms have dipped the temperature to 82°, so the record is still in play, if barely. July 25, 10 AM Update: With increasing chances for thunderstorms today, it's unlikely to persist through midnight, but this morning's low temperature of 80° would break the high minimum record for the date of 79° set in 1965. It would also stretch the record of consecutive calendar days at 80° or above to 5. With a temperature of 84° at 1 am (midnight standard time), the low temperature for Sunday, July 24, at Washington, DC broke the record warmest minimum for the date by 3°. The previous record was 81°, set just last year. The 84° low on the previous day also broke a daily record by 3°; that record was set in 1978. These 2 consecutive minimums also tied the all-time record high minimum set on July 16, 1983. This means that for the first time in records which date back 140 years to 1871, the Washington temperature has failed to go below 84° for over 48 consecutive hours. The continuing heat has also extended to 4 days a record stretch of temperatures of 80° or above. The temperature has been above 80° continuously since 8 am on Wednesday, July 20. New daily high minimum records have now been set on the past 3 consecutive days. This brings to 5 the total number of daily minimum records set or tied this calendar month. 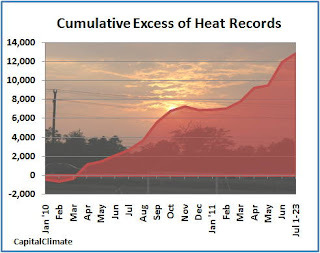 The high minimum records were also set on 2 additional days in 2010, so an entire week's worth of July daily records have been set or tied in the past 2 years. Of all of the 31 daily high minimum records for July, only 5 were set prior to 1980. In contrast, only 1 July daily low minimum temperature record has been set or tied since 1980.